It’s that time of year at the Bojangles’ Summer Shootout Series when every lap and every point matters as drivers battle for a championship. With just two rounds remaining to decide the 2015 Bojangles’ Summer Shootout Series champions, Austin Hill, Robbie Faggart and John Holleman IV were among the drivers to score pivotal wins during Round 8 on Tuesday at Charlotte Motor Speedway. Security Force Masters division Legend Car drivers Tom Pistone and Scott Whitaker started Tuesday night tied for the points lead. After an entertaining race from start to finish, both drivers stayed in the top five, but did not find their way to Victory Lane. On lap 21, with only four circuits remaining, both drivers found themselves fighting for second when Pistone slid on top of Whitaker, sending sparks flying as the veteran drivers struggled to control their cars down the backstretch. Robbie Faggart took advantage of the tussle and moved to the head of the pack and later found himself in Victory Lane, earning his second win of the season. Carl Cormier, who finished third during Tuesday’s race, also kept himself in the mix in a tight points battle with Pistone and Whitaker. With eight of 10 races in the books for the Body Mechanic Human Tuning Group Pro division, there is still no clear favorite to win the championship. Newcomer Austin Hill took home the Tuesday night victory during Round 8. Unofficially, Michael Torres remains the division’s points leader with 361 points, followed by Jared Irvan with 353 points. After finishing second in last week’s race – Hill’s first race of the 2015 season – he started second behind Gregory Lang on Tuesday, and was able to take the lead on lap 2. Reid Wilson, who spun in Turn 2 caused the race’s first caution. Lang faded to the middle of the pack, while Joey Padgett, Dillon Faggart and Jordan Black all battled for second. On the restart, Padgett spun through the grass in Turn 1 to send out the caution once again. Hill maintained his lead on the ensuing restart and Faggart took second after Padgett stayed out, followed by Irvan and Black. 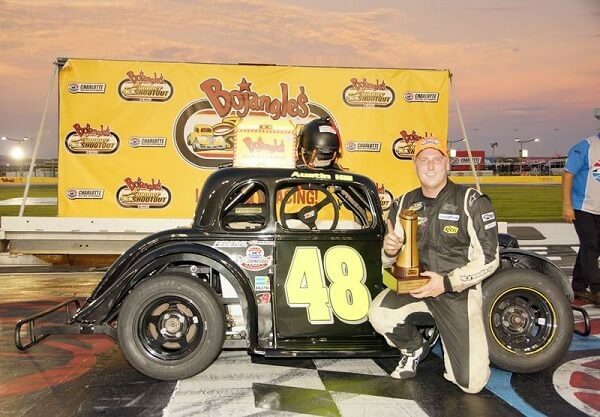 Hill took home his first Bojangles’ Summer Shootout win of the season. Faggart finished second and Irvan third. irst Responders’ school bus slobberknocker, featuring Charlotte area police, fire and emergency personnel battling for bragging rights and a coveted Summer Shootout Series trophy. Gregory Clemmons from the North Carolina State Highway Patrol bested the field in a wreck-fest that saw 2014 champion Jeremy Brown of the Kannapolis Fire Department flip his school bus onto its side. Pole sitter Tony Peeler (Kannapolis Police Department) spun through the infield grass and several school buses plowed through barrels lining the outside of Turns 1 and 2 during the eight-lap exhibition. Other winners of the night included Tyler Chapman (Beginner Bandolero Bandits), DJ Canipe (LiveWell Homes Bandolero Bandits), Ashton Higgins (Bandolero Bandits) and Chase Purdy (Young Lions Legend Cars). The Bojangles’ Summer Shootout racing action continues with a double-header at Charlotte Motor Speedway on Monday and Tuesday, July 27 and 28. Champion’s Night, on Tuesday marks the final round of racing and the last chance for drivers to race their way to a division title. The night will conclude with a huge fireworks display. For more information on the Bojangles’ Summer Shootout Series call the Charlotte Motor Speedway ticket office at 1-800-455-FANS (3267) or visit the website.